Are you trying to view newly added songs into iTunes as the song view only and not some other view such as playlist? Set the default view by doing the following. 1. In iTunes, open the View menu. By default, iTunes will remember your last selection view for future and the next time you add songs into your library. 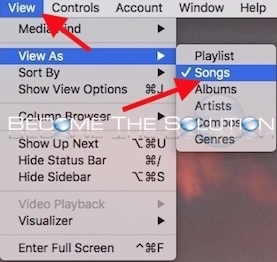 The songs view is mush more organized and offers better manipulation of your iTunes media. Every time you create new playlist the view comes back to it's default state (view as playlist). It's stupid. Exactly the same for me. And there is no keyboard shortcut (AAIK) to quickly change the view to Songs. Very annoying indeed. The comment, (whether from Apple or a blogger, I don't know! ), says: "By default, iTunes will remember your last selection view for future and the next time you add songs into your library. The songs view is mush more organized and offers better manipulation of your iTunes media." THIS IS NOT TRUE FOR MY iMac or MacBook! Every time I open iTunes (12.7 in my case) the default setting of "playlist" returns! I must manually change it each time, and for each category in the "Library" and each playlist in my "music playlist" listing! Very annoying!